In this alphabet dot-to-dot, follow the letter K to reveal the mystery K picture, and practice recognizing capital letters along the way. Kids pick lemons by completing an L maze on this kindergarten reading worksheet. They draw a path from the lemon to the hand by following the L's. Let's play the xylophone! Kids draw a path from the xylophone to the mallets by following the X's in the letter maze on this kindergarten reading worksheet. A turtle wants to get to the ocean! 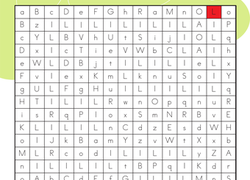 Kids draw a path from the turtle to the sea by following the T's in the letter maze on this kindergarten reading worksheet. This thirsty, thirsty hippo needs help! Kids lead the hippo to water by following the H's in the letter maze on this kindergarten reading worksheet. 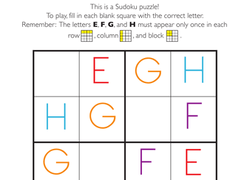 This easy Sudoku puzzle features the letters E, F, G, and H. Solve this easy Sudoku puzzle with your kindergartener. 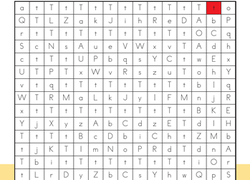 On this kindergarten reading and coloring worksheet, kids consider the clues and follow the letter N in a dot to dot to reveal the mystery N picture: a nickel! On this kindergarten reading and coloring worksheet, kids consider the clues and follow the letter Y in a dot to dot to reveal the mystery Y picture: a yo-yo! Practice putting together a "P" puzzle with this picture perfect printable! 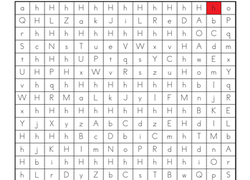 Your child can cut out these pieces to create his own alphabet puzzle. 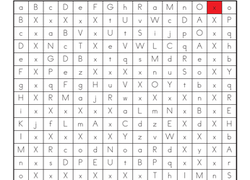 Completing this dot-to-dot is as easy as ABC. Help your child practice his alphabet with a fun Christmas printable!